In April, 1879, T.A. Andrews and J.M. Matheny came to Rawlins County. 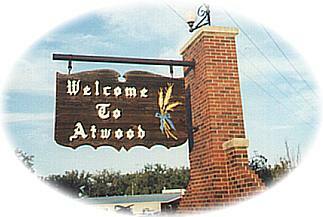 They established a town site about two miles east of the present location, and named the town ATTWOOD for Matheny's 14 year old son who accompanied his father on the over west. It became apparent that the site was on school land so to gain clear title it was moved to the present location. In 1882, the Post Office requested the name drop one "t" becoming ATWOOD. A standing tribute to the early pioneers, Atwood's presence on the prairie still boasts the friendly atmosphere and hard work ethic from which the city was born. When Atwood was settled in the Beaver Creek Valley in 1875, it became home to Germans, Czechoslovakians, Scandinavians, and other immigrant families that still live, work, and prosper in the heart of Rawlins County. Visitors can find information and large variety of crafts, antiques and collectibles in the Ol' Depot, or one might choose to shop downtown Atwood located only a few blocks away. Atwood's business district is proud of its historic, yet well kept appearance. With stores of every kind, there is nothing to prevent shoppers from finding anything they need. The renovated Atwood Depot is now a gift and collectibles store that sits at the edge of Lake Atwood. The Buffalo Statue is located in front of the courthouse and was presented to the city by local sculptor, Pete Felton, renowned Kansas artist.